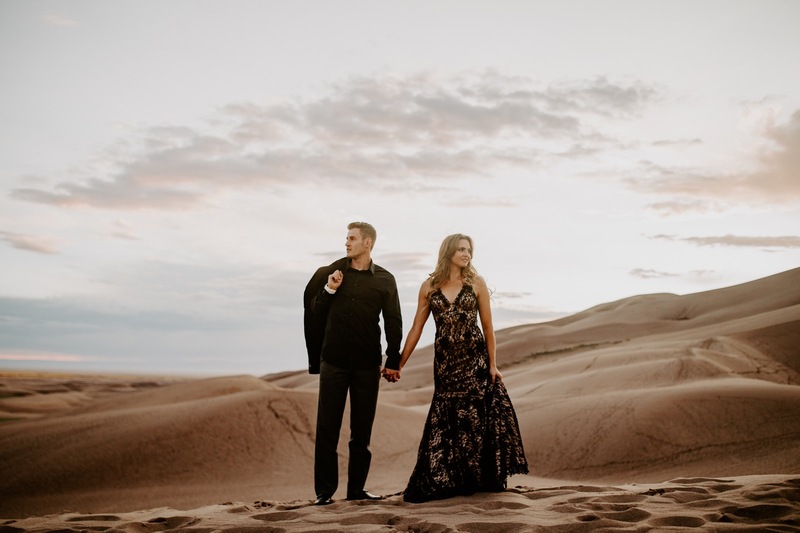 Lindy & Sterling chose The Great Sand Dunes National Park for their engagement session, which is probably one of the most stunning places ever. When we started to search out for locations for their session, Lindy brought up the sand dunes. I have never been to this park, but thought it was an amazing idea, and to book that location. As we arrived a storm came in and it poured for the whole afternoon. I wasn’t sure if we were going to be able to get their session in, but the moment Lindy & Sterling arrived, the storm was passing and the sun began to peek through the clouds. The rain cooled down the sand and drove a lot of the tourists out, which was perfect on this August day. As we began to walk out to the dunes, they appear smaller than they are until you start to hike them. If you haven’t hiked up sand dunes, it is difficult. They look small from a far but as you begin to summit, it takes a lot more out of you then it seems.